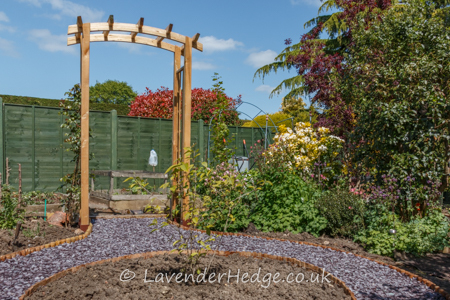 We purchased this wooden garden arch to replace a cheap metal arch that rusted very quickly. 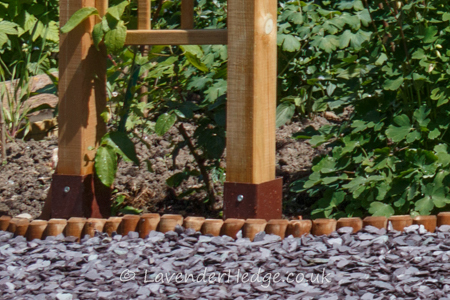 This Moonlight rose arch is made from pressure treated FSC certified wood and comes with 10 year guarantee against rot. However, to help preserve it, we decided not to bury the support posts in the ground and used metal post supports with long spikes instead. The arch itself was easy to construct and made of good quality wood and the plants are well supported. The difficult part was hammering the metal posts into our clay soil without them twisting and making the arch look lopsided. It might have been easier if we had chosen to set them in concrete, but after a few attempts it looked fine. On one side I am growing a climbing rose called High Hopes, together with Clematis florida Flore-pleno. On the other side is a climbing rose called Casino and Dr Ruppel clematis.